Hong-Kong style cafes have been a part of my life since I was a young'un. Think of it, who doesn't salivate at the though of ketchup-based sauces that are versatile enough to double as pasta sauce? Or how about a hot dog wiener posing as a breakfast sausage? How about macaroni in soup qualifying as a breakfast item? 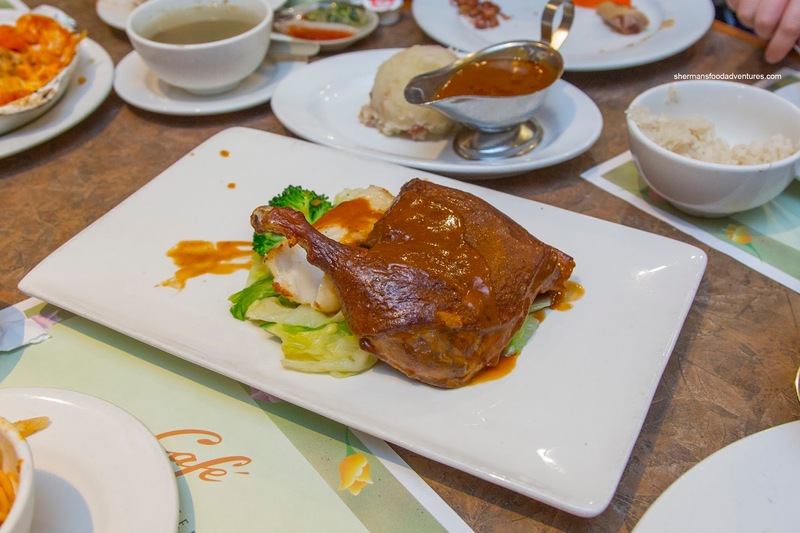 Yes, the beloved HK-style cafe, misunderstood by many, but loved by the ones who grew up on it. 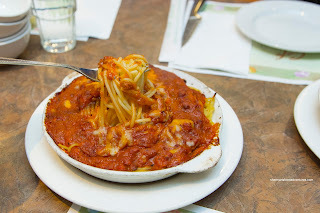 One of the originals, which also happens to be one of the fancier spots, Goucester on Cambie has survived all these years including the building of the Canada Line. We used to go here all-the-time, but not as often since we moved to Burnaby. But due to some loyalty coupons, we accompanied my parents on 2 separate occasions. 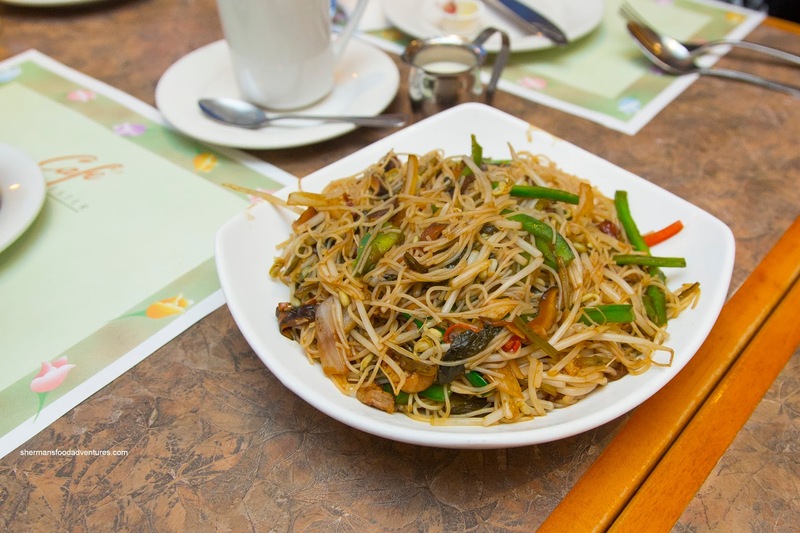 On our first visit, we went with a stir-fry dish being the Vermicelli with Pork and Pickled Vegetable. This was a bit wet, yet still had decent wok heat. Noodles were al dente, but the large amount of peppers dominated the dish (in not so appealing manner). 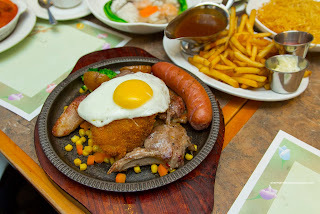 In true HK-style cafe fashion, we got the Mixed Grill on a hot cast iron plate. It consisted of minute steak, pork chop, lamb rack, smokie, fried basa, fried egg, veggies, fries and gravy (black pepper in this case). Pretty standard stuff except the lamb was really tender while the fish was flaky. Due to the thinness of the steak, it was well-done. The accompanying black pepper sauce was peppery and also salty. In addition to a baked pork chop rice (which I'll talk about later from our second visit), we had the Seafood Penne Cream Pasta. 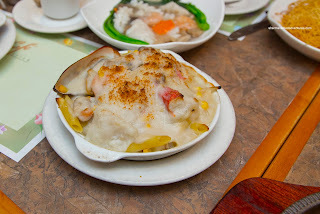 This was classic HK-style cafe style with a starch-thicken cream sauce that was mild and slightly sweet. There was an array of seafood including shrimp, mussels, fish and imitation crab. This was okay, but hardly flavourful. 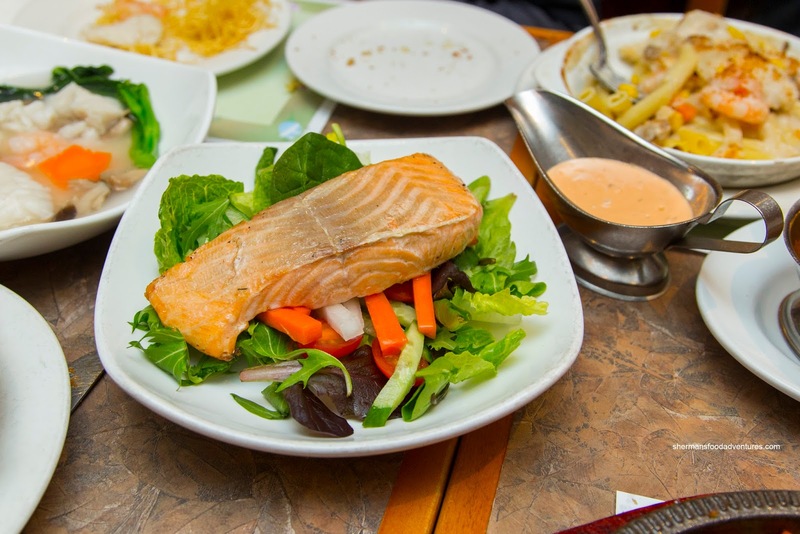 Looking rather pale and unappetizing, the Salmon Salad was better than it appeared. With the skin removed, we assumed the salmon would be dry, but it was actually moist and flaky. However, it wasn't particularly flavourful though. The side of thousand islands dressing was the main seasoning for the dish. With our second visit, we shared the Free-Range Hainanese Chicken with rice. Being free-range, the meat was fairly chewy, but still tender and not-dried out. The skin was nicely gelatinized and well-seasoned. 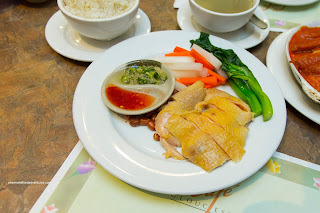 Surprisingly, the chicken oil rice was on point being nutty, chewy and flavourful. Just like last time, I was not particularly enamored by the Baked Pork Chop Rice as it was overloaded with onions. Hence, the flavour profile had this raw onion finish. On the positive side, the pork chop was large and tender while the sauce was mild and creamy. 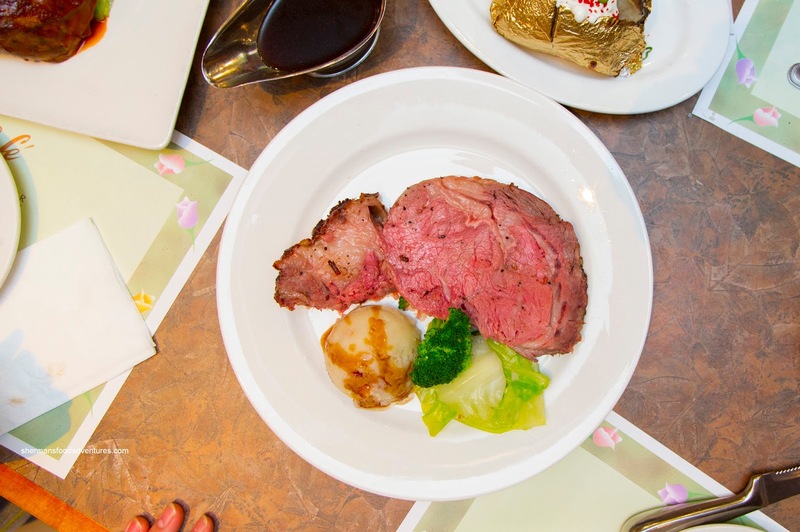 For myself, I got the Prime Rib with baked potato. For me, it looked more rare than medium rare which I requested. As such, it was not particularly easy to eat as it was thick-cut. I found the meat to chewy where only the cap was tender. The meat wasn't particularly seasoned well either, but the side of jus helped in that regard. This was a fail in my books. Viv went for the Braised Duck Leg and Cod. I liked duck leg as it was tender, silky and moist. It was well-seasoned from the braise where the sauce wasn't necessary. As for the cod, it was fairly flaky and moist, but in need of more salt. 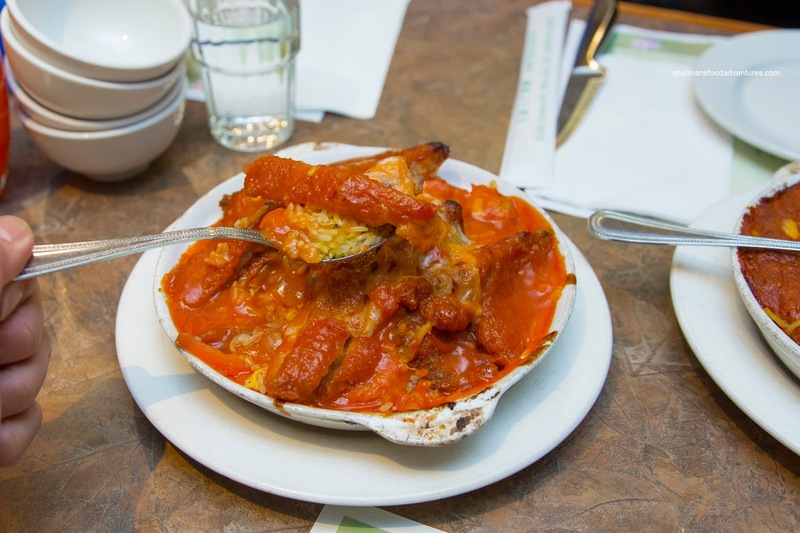 For good measure, we got another HK-style cafe classic in the Baked Spaghetti Bolognese. Naturally, this was not the classic recipe, but it was fairly decent. The meat sauce was thick, full of meat, carrots and a touch of star anise. The noodles were not too over done while the light amount of cheese ensured it wasn't too greasy. As much as I've had great memories here at Cafe Gloucester, it seems to me that after these 2 visits, the food ain't really worth the extra cost. It isn't bad per se, but I can get better elsewhere for less.